Scientists advise us all to make at least half our grains whole, and in the U.S., the new “MyPlate” graphic encourages everyone to make space for whole grains on every plate. The Whole Grains Council’s October 17-19, 2012 conference in San Antonio, Texas, oﬀered fascinating speciﬁcs on how we can get more whole grains onto plates around the world, with useful information on consumer attitudes, new ingredients, new research, and successful promotion programs. Click on the link above to see the entire program of the conference, including downloadable presentations from most of the speakers. We were delighted to have San Antonio’s own Chef Keith Cruzan as our Guest Chef during the conference. He demonstrated the preparation, then we enjoyed lunch based on his recipes. Below are the whole grain recipes he shared with us. At every Oldways conference we provide a program book packed full of background information that deepens attendees’ appreciation of the conference, with fascinating background materials. You can download this information here, for free! Check out the expertise of our speakers, and thumbnail descriptions of their presentations. • What is Whole Grain-Rich? 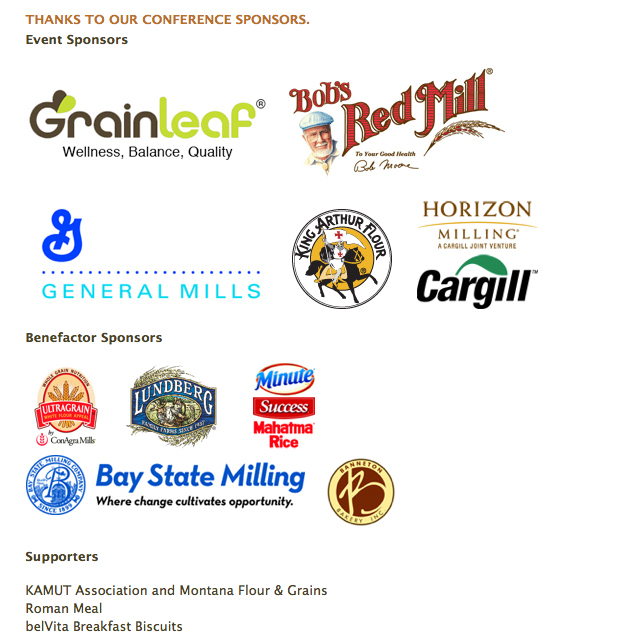 A big thanks to our conference sponsors and supporters, who helped make this conference the best one ever!